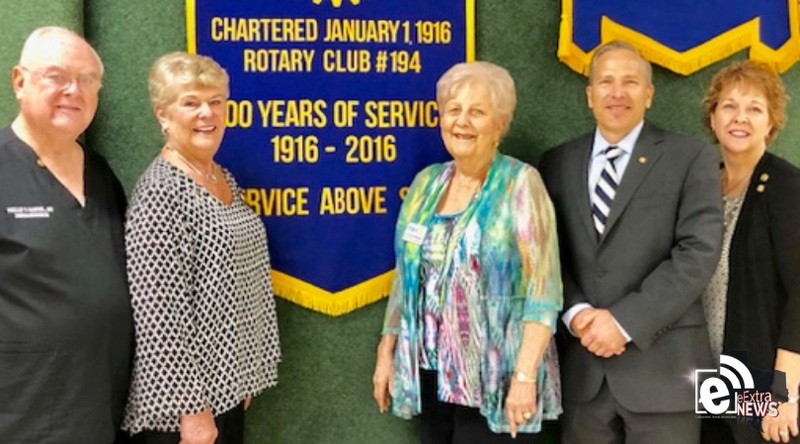 During the Oct. 4, 2018, meeting of the Rotary Club of Paris United, District Governor, Judy Guthrie was the guest speaker. DG Judy is from the Carthage, Texas, Rotary Club. Excerpts from her speech are provided below. Pictured from left to right: PDG Dr. Phil Bandel, DG Judy Guthrie, PDG Jo Ann Parkman, Club President Andy Cobb, and AG Susan Chapman. “Rotary’s greatest asset is membership. When membership increases, our clubs become more vibrant. Membership is Rotary International’s highest internal priority. The unique perspectives and expertise demonstrated by members of all ages are used to improve lives everywhere with impactful and sustainable projects. Making Rotary attractive to young professionals, as well as those reaching retirement, are now fully and equally important to Rotary’s future. Younger professionals need Rotary to help their careers and to give back to their communities, in turn, Rotary needs these young professionals for new ideas and to ensure Rotary will last another 100 years. Meanwhile, recent retirees have great experience and wisdom to offer a club. The advancement of international understanding, goodwill, and peace through a world of fellowship of business and professional persons united in the ideal of service.